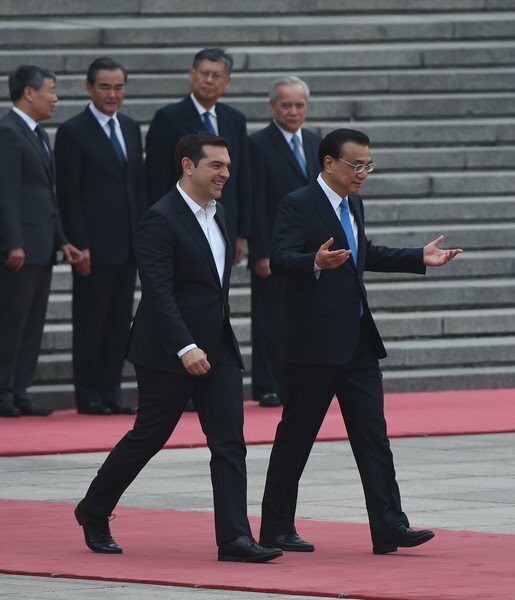 Prime Minister Alexis Tsipras in a speech during a roundtable discussion referred to the Belt and Road initiative saying that Greece has a strategic role in this. Tsipras referred to the Silk Road reminding that hundreds of years ago, in 550 A.D., the Byzantine Emperor Justinian sent Christian monks to the East in order to discover the secrets of the development of Silk. “Apparently, after many adventures, they returned to modern-day Thrace with silkworm cocoons hidden in their staffs, introducing silk to Europe for the first time. If we were to retell, today, the history of the Silk Road, we would not only retell an economic history of cooperation and competition between great-powers, religions, nations and commercial interests, but a history of people, their contact and communication. We would not only see how the Silk Road developed from the top-down, but also from the bottom-up. The commercial and cultural contacts of the Greek and Chinese people stretch back thousands of years. They have traded, worked with each other, traveled to each others’ lands and inspired each other with their struggles. But the real acceleration of economic, cultural, educational, research exchanges and tourism, has taken place only in the last few years, with the development of our bilateral strategic partnership and then the development of the Belt and Road Initiative. This Initiative is based on the development of Infrastructure and Connectivity projects bringing Europe and Asia, as well as other parts of the world, closer together.But if it remains only a series of projects, it will not fulfill the vision on which it is based. It will not be a vibrant Silk Road of the 21st Century. The Belt and Road Initiative gives us a remarkable platform with which to connect initiatives enhancing people-to-people contact and I believe we should make full use of it. A few days ago with the close cooperation of China, we hosted the “First Forum of Ancient Civilizations” in Athens, highlighting the importance that this form of dialogue has for global and regional cooperation and development. 2017 will be the Greek-Chinese year of cultural exchanges with many events planned in museum cooperation and exchange of artifacts and exhibitions, translations of literature works, co-production of films and book fairs. Furthermore, we are working very closely in order to enhance educational and academic exchanges and of course tourism. Particularly in tourism, but also in culture, we are exploring the possibility of cooperating further with China, through our bilateral and triangular cooperation with other countries of the Eastern Mediterranean and the Balkans.